It is the year 2073, sixty years after the world was swept by the accidental release of the man-made Plague virus. Society's collapse was a brief one. Brief, because the survivors remembered the luxuries of the early Twenty-first century and wanted them back. The world was different after the Plague. Many of the children were twisted and deformed. Mutants. Out of this situation, the paranoid and hateful rose to power by using force and lies to terrify the confused. As the years passed on, those mutants who did not die in their youth were growing to maturity. The Second Republic, the subtly cruel post-Plague government in what was once the United States of America, publicly divided the mutants into two groups: the Acceptables, those with only minor deformities; and the Mutazoids, creatures of barely human appearance. There is also a third group whose existence is officially denied by the Second Republic, sometimes called Supers, who resemble normal humans but have extraordinary powers. The Acceptables are the majority of the population and they must be controlled. 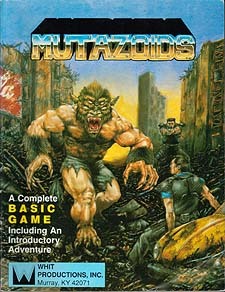 The Mutazoids are wild beasts to be herded or eliminated. To some people the argument seems reasonable. These mutants are infected with the Plague; they should be quarantined! But then, why aren't they separated from the unaffected humans completely? What is the real threat in the Second Republic? What is really going on? That's your problem; you're an Enforcer and you Work for the Second Republic!